I want to make a copy of a model and rename it (along with all of the pieces inside of it) with a new name, while still keeping it in the same folder in Accumark. What is the best way to do this? In order to do this, I've been copy/pasting pieces into another folder, then renaming them and copy/pasting them back into the correct folder, and then saving all pieces as a model under the new name. This seems excessive, so I'm wondering if there is an easier way? Go to AM-Explorer: Right click over the model and select "Save As with Components". 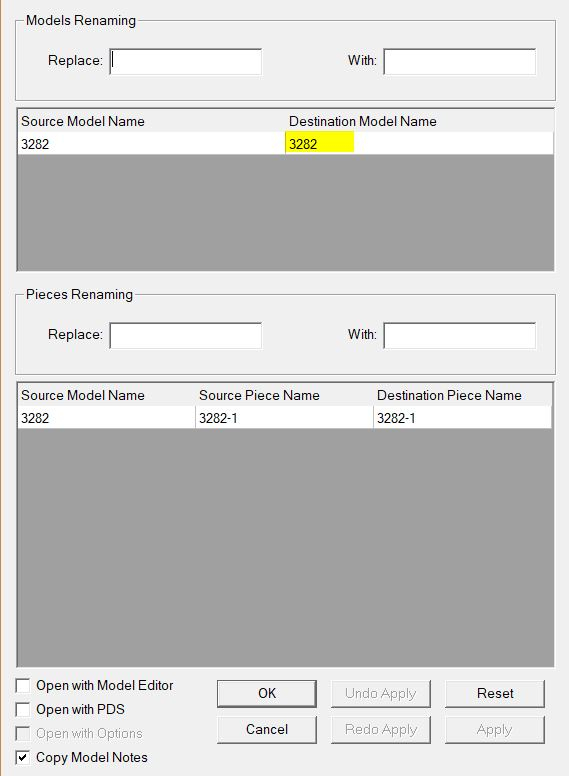 You will get a dialog box and you can rename all or part of the model name and the piece names. It will create a new model with the new name and/or new piece names Try it! I love that you are wanting to work smarter, not harder...hence the beauty of Accumark Explorer, right ? You can "copy" a model into the same folder by right mouse button clicking on the model and selecting the "save as w/ components" option. A dialogue box will pop up, you will then select drive/storage area to save the "new" model. Once this is done, a second dialogue box will pop up (see below). You will give the "Destination Model Name" (see yellow highlight) a new name. You can also decide if you want to rename the pieces or not. Once finished renaming, then click ok. Your old model is now "new"! I hope this helps. Let us know if you have any additional questions. If you have the model open in PDS you can also use the File\Copy Model function there. This way if you are already working in PDS you don't have to exit to go back to AccuMark Explorer.